For decades, as an ICT4D intervention, telecentres have been built across many regions in the global south, with the aim to bridge the digital divide and bring socio-economic benefits to local communities. The result is mixed to say the least. Many telecentres were not sustainable due to a number of reasons. In recent years an upgraded and “sexier” version of telecentres, tech hubs, have been rapidly diffusing in the global south. In 2018, GSMA reported 442 tech hubs in Africa and 565 in Asia Pacific (Giuliani 2018). They are spaces that not only provide co-working space and Internet connection, but also claim to foster collaboration, entrepreneurship and innovation. This is a model that seems to have stemmed from industrialised regions and diffused to developing countries, as part of the digital and mobile boom, and promise to produce ‘local innovations by local people’ (Afrilabs). GIZ’s 2013 report describes this movement as “from Silicon Valley to Silicon Savannah”, indicating the high expectation projected to Tech Hubs to boost innovation and economic growth. Many hubs are designed to mirror their Western counterparts. iHub in Kenya, one of the oldest and most prominent hubs in Africa got the inspiration from “successful co-working spaces across the world”, and “the team went to work transforming the sterile office block into an interactive hive. They threw bright green paint on the walls, installed a snappy Internet connection, and imported a slick Italian espresso machine” (Sanderson 2015, p.6). Although there is plenty of research in organisational studies that argues materiality of physical space shapes human behaviour and organisational practices, our research which compares a Tech Hub in central London with one in Lusaka (Jimenez & Zheng 2016, 2017) shows that the physical design of the hub may not be directly related to how the space is used by the members and what value is generated from it. Members in the London hub, a global chain boasting extensive networks of entrepreneurs, greatly appreciate the aesthetics and design of the hub as a co-working space, but there is limited sense of a collaborative work. As one member stated: “[f]or shared workspace I think it’s a great place, apart from the intention of trying to get people to collaborate which I don’t think it happens that much.” It was found that despite the open design of the space, strict rules are applied on how segments of the space are used thereby imposing a structured, disciplined order in the Hub. “So you find people around here could really help you. If I ask him how do I go about with this because sometimes I am stuck, people come and help me. Nevertheless, while the Lusaka hub had an innovative and learning culture and clearly was highly valued by local entrepreneurs, it struggled to show evidence of market-based innovation success. In contrast, another study on Tech Hubs in central Manila shows that while it physically resembles the colourful, open design of coworking spaces in the West and provides high speed Internet that is not widely available in the Philippines, the membership fee to use these spaces were not affordable to local entrepreneurs (Tintiangko & Soriano 2018). They therefore become spaces for international expats and local elites, in effect excluding the grassroots entrepreneurs who could benefit from the hubs the most. So far, we only have some broad ideas of the emerging landscape of Tech Hubs across the globe (Friederici 2018), and limited understanding beyond selective in-depth case studies (Sambuli & Whitt 2017, Haikin 2018, Littlewood & Kimbuyu 2018) of what actually happens in the Tech Hubs, the impact they may have on local community and how they evolve over time. We believe that behind the homogeneous branding of Tech Hubs all over the world as “spaces for innovation”, there are almost certainly heterogeneous modes of enactment of the spaces that give rise to multiple, or limited, values to local communities. Jimenez, A. & Zheng, Y. (2017) A spatial perspective of innovation and development: innovation hubs in Zambia and the UK. In P. J. Choudrie J., Islam M., Wahid F., Bass J., ed. Information and Communication Technologies for Development. ICT4D 2017. Springer, 12-14. Jimenez, C. & Zheng, Y. (2016) A capabilities approach to innovation: a case study of a technology and innovation hub in Zambia, paper presented at Twenty-Fourth European Conference on Information Systems (ECIS), Istanbul, 12-15 Jun. Drawing on our analysis of digital policy, we highlight two important directions that countries have taken around digital policies. This model extends a previous working papers by Bukht & Heeks produced as part of the DIODE project. Broader liberal strategies for enabling markets for digital trade highlight the importance of developing the national regulation and conditions to maximise diffusion and impacts of digital products and services into the country. This includes, for instance, creating conditions to attract foreign digital firms and ensuring that benefits are evenly distributed by increasing the digital participation of marginalised groups. On their own, however, market enabling policies might not necessarily produce the desired economic objectives in terms of technology learning and localization. As such, we also consider a more selective approach which we refer to as digital catch-up policy. This second approach is more interventionist and strategic in nature and it requires higher political capital and knowledge in the policy-making process. As shown below, the two directions are not mutually exclusive and potentially can be complementary. Key approaches to digital policy (include specific areas of policy instrument). To expand and think about implications of such a policy model, we undertook two case studies of Brazil and Indonesia. These studies provide insights for how policy makers can regulate and deal with the challenges of the emerging digital economy. Overall, directions of digital policy in these two countries have lots in common. Both countries already have core digital regulation and infrastructure in place and policy makers are working to refine policy to ensure that it fits with the rapidly evolving needs of the digital economy and digitalisation. Moving beyond solely market enabling policies, we see that both countries focus on a number of strategic areas through interventionist policies. Not all of these initiatives have been effective and some carry costs, but in certain areas they have been associated with more vibrant local sectors that are helping build capacities and increase local economic value-added. South Africa (and other emerging and developing countries) faces similar challenges in trying to bridge the technological and industrial gap with more advanced economies in a rapidly changing landscape. At the same time there is a need to ensure that digital policy is inclusive to achieve broader societal outcomes. A number of policy lessons can be learnt for South Africa from the cases of Brazil and Indonesia. Policies to enable growth in digital trade are important to provide the framework for the expansion of the digital economy. Underlying this, there must be substantive investments in broadband infrastructure and appropriate regulation. An emphasis on inclusion policies will lead to more broad-based benefits from the digital economy. To support local firms, digital ecosystem policy is a crucial consideration in grounding the benefits of the digital economy. This includes policies to support the growth and scaling-up of start-ups, and the higher participation of MSMEs in digital trade. Furthermore, encouraging global digital firms to localize some of their activities and to build domestic linkages is an important policy objective. As the ‘disbenefits’ of the digital economy become clear, policy makers need to legislate to reduce challenges in areas such as tax, data protection and the platform economy. Reflecting the importance of scale, regional integration is crucial in terms of digital policy. Broader markets, interoperability and national-regional strategic alignments are key to expanding markets, attracting foreign firms, and potentially increasing their commitment to a region. 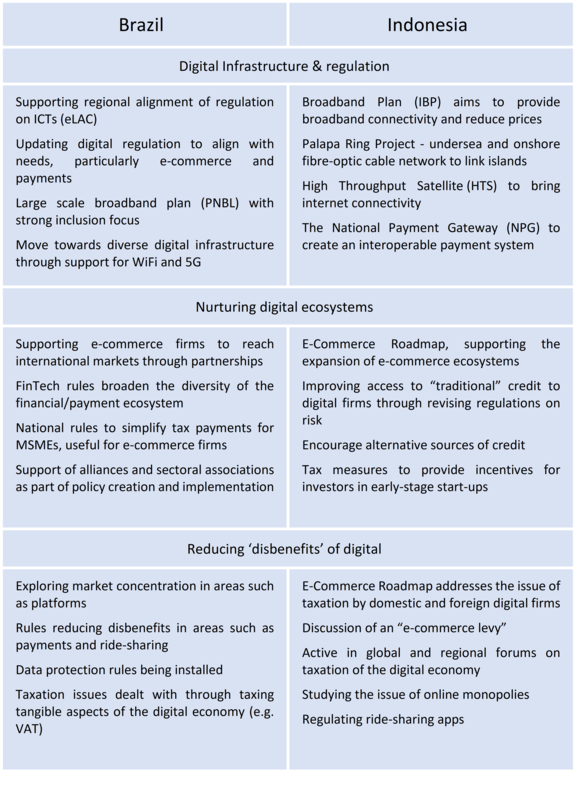 Digital catch-up policy provides an important direction for supporting digital growth. Our work reveals a broad range of potential catch-up policy instruments in the digital economy (e.g localisation, incentives, and national digital projects). Future examination should explore the specific catch-up policies that could be fruitful in the case of South Africa. Policy model – Azmeh, S. & Foster, C. (2018) Bridging the Digital Divide And Supporting Increased Digital Trade: Scoping Study, Discussion Paper, GEG Africa, Pretoria, South Africa. Case studies of Brazil and Indonesia – Azmeh, S. & Foster, C. (2018) Bridging the Digital Divide And Supporting Increased Digital Trade: Country Case Studies, Discussion Paper, GEG Africa, Pretoria, South Africa. It is generally accepted that broadband plays a key role in the world, impacting the economy, productivity, employment and other spheres of society. The national governments in both developing and developed world are either contemplating or are already executing broadband access plans. India is no different. The Broadband Policy of India aims at enhancing quality of life through societal applications including tele-education, tele-medicine, e-governance, entertainment as well as employment generation by way of high speed access to information and web-based communication. By 2010, only 0.53% of India’s broadband connections were working on optical fibre. On 25 October 2011 the Government of India approved the setting up of National Optical Fiber Network (NOFN) which will be connecting all 250,000 gram panchayats (GPs) (group of three or four villages make GPs). In Jan 2012, the government had formed a special purpose vehicle for the same, called Bharat Broadband Network Limited (BBNL). It was estimated that additional optical fibre cable (OFC) deployment of 301,000 route kilometres mainly from blocks to villages to cover the 250,000 GPs as part of the backhaul network is needed. The final deployment plan is based on utilizing the existing optical fibre network of BSNL, POWERGRID and RAILTEL. The NOFN is to be rolled out in a phased manner at a cost of 4 billion USD and was slated for completion in December 2012. The funding for the project shall be from Universal Service Obligation Fund (USOF) collected from the telecom service providers. Upon the completion of the NOFN roll out, GPs were expected to get broadband connectivity with speeds of up to 100 megabits per second. In the BharatNet plan, optical fibre is being laid till the GPs’ office. The onus of taking Internet from that point of contact to the end users is left to the service providers. The service providers can be private, public, NGOs and semi-governmental organizations. Private entrepreneurs in GPs have a greater role to play in taking broadband to the households and individuals through BharatNet. The other important players in the village ecosystem are NGOs, political activists and semi-governmental organizational personnel. Either they provide information to the needy or deliver services to the GPs by making use of BharatNet or serve as a bridge between service providers and the people; and they can also be called infomediaries. The most celebrated case of M-Pesa in Kenya in addressing financial exclusion problem through mobile phones is great example of institutional users playing a major role as infomediaries in scaling up the innovation (Foster & Heeks, 2013). M-Pesa grew because of small agents and distributors who introduced new mechanisms to serve the customers, which later were adapted by Vodafone, the telecom service provider. As the institutional users are closer to the rural populace, they would be able to adapt or customize BharatNet for wider use and diffusion. The diffusion or uptake of BharatNet is dependent on the institutional users in rural India who double up as infomediaries in rural India. In the case of broadband, the absorptive capacity of the stakeholders or the infomediaries is important to fully realize the benefits of the infrastructure. The future potential service providers are expected to have capacity to understand, learn and garner the benefits. Once the optical fiber is laid, the absorptive capacity of the institutional users will determine the level of reach of broadband to the rural households. Though the optical fiber is laid by the government, scaling is possible only by the multiple sets of institutional users. BBNL embarked upon pilot projects in three blocks covering 58 Gram Panchayats in three different states and completed by 2012. Given that pilot GPs had received BharatNet in 2012 and other GPs are in the process of receiving the same, there is need for an empirical study in the mid-term that helps the implementation process. Some of the findings are reported here. 24 Gram Panchayats were selected using systematic random sampling in Arian (16) and Paravda, Vizag (8). Computer assisted in-depth interviews were conducted in person with 1,329 respondents from state government, central government, private and non-governmental and semi-governmental organizations in 2016. In the sample of institutional users or respondents, 77% of respondents are males. 37% of sample fell in the range of 26-35 years and 34% in 36-50 years. Only quarter of sample had education below 9 years of schooling. Almost all of the respondents had a photo id card, aadhaar card and bank account in own name. Two thirds of them know how to send SMS, half of the know how to use search engine, and use email. One tenth of them can troubleshoot hardware and minor software related problems. 68% are from private organizations, 23% from state, 2% from central and 7% semi government organizations. Among the private organizations, 59% are petty traders. Overall, half of the sampled organizations have been started seven or more years. Of the customers served by them, 68% come from the same locality. Half of the sample is receiving electricity for more than 10-12 hours and 35% for 7-9 hours during 0600-1800 Hrs. In overall, 30% of the respondents claimed that they are aware of the BharatNet / NOFN of which 8% claimed to know it very well. Awareness about ICT related programmes appears to be poor: 83% did not know about optic fibre, 76% about Digilocker and 68% about Digital India. “Newspapers” at 39%, “Friends and Family” at 37% and “Televisions” at 30% are top three sources of information about BharatNet / NOFN. Half of the sample incorrectly assumed that BharatNet / NOFN provides free Internet to people. Slightly less than half felt that poor electricity supply will affect BharatNet /NOFN. Among the Internet users, the top reasons for not using BharatNet / NOFN are: ‘Equipment breaking down’ (54%), ‘Slow Internet connectivity’ (53%), and ‘Already having internet’ (54%). The respondents are optimistic about the potential uses of BharatNet / NOFN. Following are some of them: ‘Learn new skills for personal use’ (65%), ‘Access to better hospitals’ (66%), ‘Finding new business opportunities’ (63%), ‘Access Internet banking’’ (70%), ‘Finding new job opportunities’ (66%), ‘Getting information about Government Schemes’ (76%), ‘Learning new things through online videos’ (78%), ‘Learning new skills for employment’ (68%) and ‘Receiving required latest information’ (67%). Out of 1329 contacted, only 32 institutional users access BharatNet. 65% organizations do not use Internet from any source. 62% of the institutional users do not use Internet at the personal level as well. Among non-users, intention to use Internet in future is about only 16%. Half of them do not intend to use Internet. One third of organizations reported that they are computerized. Inter-office connectivity is better among public organizations. In nearly 2/3 of the organizations, the respondents do not have additional personnel to handle the ICT related infrastructure. The Internet is used 3-5 hours per day by the organizations. The top three activities done at the personal level are: Reading information online, listening to music/radio online, and video. Among Internet users, interaction with suppliers (33%), contacting potential customers (33%) and interaction with customers (26%) are done ‘somewhat frequently’ or more. Only 8% of users are open to provide Internet as product or services to external people, if permitted. The top three triggers for Internet use are: ‘to get instant information access’ (69%), ‘can do many things at once using Internet’ (58%) and ‘everyone around is using Internet’ (51%). The top three barriers are: ‘can continue work without Internet’ (75%), ‘do not have required devices to access the Internet’ (73%), ‘no prior experience of using the Internet’ (52%). There is a need for public information campaigns among the institutional users and other stakeholders, as extant awareness about BharatNet is poor. A demonstration of benefits and opportunities available is likely to result in better adoption. Trade associations should conduct activities to spur entrepreneurship in the rural digital entrepreneurship space. Innovation hackathons may be one of the activities. NGOs can work with private firms to deliver ICT based goods and services in rural India, by utilizing the corporate social responsibility funds to be spent as per government regulations. Local private entrepreneurs should be encouraged to explore new businesses on the basis of BharatNet. Contact center for e-health, online education, skills training, and business process outsourcing is a possibility. The post implementation scenario can be handled in three major models: government-led, private-led, and shared model. We would like to thank Ford Foundation, New Delhi for funding the study. However they are not responsible for the contents in this report. Over the last few years, the use of digital technologies has grown rapidly. The Internet has played a key role in driving this digital growth. However, whilst these new developments have created many advantages and brought varying degrees of development and ‘inclusivity’ in developing economies, issues of governance and policy are growing almost simultaneously with every new innovation and development in digital technologies. While a clear majority of these are issues of infrastructure (technical), online security and privacy (ethical), there are also other emerging aspects which require immediate policy reviews. Take for example bike-sharing platforms. Cities in the UK have recently seen a splurge of hi-tech rental bikes on its streets. These ‘dockless’ hire systems allow users to pick up and leave the bike anywhere for just £1 an hour, locking and unlocking them with a simple smartphone app. The flexibility of use of these station-less smart bikes (unlike the Transport for London’s Boris/Santander bikes that need docking at specific docking stations) has popularised use of oBike (a Singapore start-up) and moBike (a Chinese start-up). While this new pollution-free, high-tech bike-sharing transport system has provided many, especially those without the potential of owning a personal bike, an opportunity to travel around the city quickly and at minimal costs, this newly introduced digital economy business model has raised new regulatory issues. The bikes are not quite as nature-friendly when they are left at any nook and corner. In London, the masses of bikes created a huge hindrance for pedestrians, wheelchair users and those with buggies, as they began cluttering the streets and blocking paths. In Manchester, newly launched Mobikes were reported being sabotaged, stolen or dumped in canals and bins. Such outcomes highlight emerging tensions for policymakers as they seek to encourage innovation and business start-ups, and promote sustainability. The above refers to incidences in a developed country with supposedly advanced transport systems and planning regulations. If the same approach were to be applied in developing economies, leaving these dockless bikes lying around in the streets that are already overwhelmed with traffic, vendors and pedestrians can lead to even more drastic consequences, not ruling out the added possibility of these bikes being pilfered. Already, in China, where this business model was initially carried out, piles of these hire bikes were found dumped on the streets of Shenzhen. While the idea of introducing these bikes in China was for a sustainable cause – to help lower congestion and air pollution – it led to further unnecessary congestion and pile-ups. Other parallels can be drawn with similar business models and platform companies, such as the food delivery courier Deliveroo, the car-hailing platform Uber, and the home-sharing app, Airbnb, where governance is a growing issue. The recent legal actions against Deliveroo and Uber highlight the issues around self-employed contractors without access to benefits such as sick pay, paid holiday, pensions, and protection afforded by the minimum wage. Deliveroo claimed that the current law does not cater to the flexible working system where the company pays its workers by the job and not by the hour, and even called for a change in UK law to be able to give its workers more rights. Uber too maintained that its drivers are self-employed contractors rather than permanent employees and are not entitled to such benefits. Despite these persistent claims, Deliveroo was forced to remove a controversial clause in its agreement which restricted couriers’ ability to challenge their self-employed status at an employment tribunal and work for other companies. Deliveroo was also made to remove a clause that obliged riders to give two weeks’ notice to terminate their agreement with Deliveroo. Uber on the other hand lost a court case when the employment tribunal ruled in favour of cab drivers and ordered Uber to pay drivers national living wage and holiday pay (though Uber is appealing the decision). In a similar incident in 2012, an MTurk worker filed an employment lawsuit in California against CrowdFlower, an intermediary firm between the MTurk platform and several end-clients. The microworkers claimed they were misclassified as independent contractors and paid less than the legal minimum wage. The suit obtained class action status and was settled in 2014 for $585,000 in favour of MTurk workers who had done more than a minimal amount of work for CrowdFlower. While the above cases show a positive outcome to cases against gig economy operators in developed economies, where ministers can order a crackdown on these firms, such sophisticated and organised systems are often absent or lacking in developing economies with similar problems. Lawsuits can be highly unaffordable for those in developing countries, not forgetting that these gig economy workers may also be illiterate (e.g. cab drivers, courier personnel etc.) and unaware of their legal rights. Corruption within the legal system may also hinder gig workers in these economies from filing cases, where companies are powerful and able sometimes to bribe their way out of such sticky situations. These drawbacks open the door for greater exploitation of workers within developing economies. Laws need updating to cater to the new business models of the digital economy. However, with innovation moving faster than regulation being brought in, legislation is rarely achieved quickly. What little legislation exists only serves narrow interests and provides minimal protection for workers and users. So what are the implications for developing countries? And how can developed economies lead the process for change to benefit developing countries? For one, developed economies are leaders in setting standards and perhaps need to do more in terms of ensuring that these high standards are met not only within its own jurisdictions but also across borders where such international companies operate. Governments in developing economies also need to be more proactive in understanding and regulating new models of work as well as working with platform firms to curtail exploitation. The weak labour laws and governance in developing countries can sometimes be an attraction for companies in the West keen to penetrate markets in developing countries. This often leaves workers in developing economies open to exploitation and at a severe disadvantage as their governments are more interested in attracting new business investments and businesses in gaining entry to new markets. It is common knowledge that online microworkers in developing economies are paid less than their counterparts in developed economies for the same work. It highlights the need to reform existing regulatory frameworks. Further, with relatively weak institutions and capacity for implementing policy in developing countries, the issues can be even more detrimental. Shocking stories of rapes by Uber and Ola cab drivers have been a regular headline in the news in India, and growing. This resulted in a temporary ban on these services in New Delhi, as it was discovered that Uber had not carried out proper verification checks on drivers. But little has been done in terms of legislation to avoid these incidents in future. Such negative occurrences can be a hindrance to the growth of the digital economy in developing economies that can otherwise benefit from the use of digital technologies. It is also well-known that there is a massive digital divide between developed and developing countries, urban and rural regions, when it comes to anything digital. Within developing economies, rural areas and women and girls are often found to be excluded from participation in the digital economy due to various infrastructural and cultural issues. Thus, new business and employment models are not quite accessible to these women or to those at the bottom of the pyramid who live below the poverty line and struggle to buy a meal a day, let alone have the income to pay for bike hire. There is a danger that such business models, while bringing new benefits, can also create a wider divide among urban-and-rural regions, and consequently between developed-and-developing economies. As new business models of the digital economy make their way to the Global South, the importance of developing sound digital economy policies in developing/emerging countries must be emphasised. Emerging/developing markets are the engines of global growth and generate some of the most attractive investment opportunities globally. The IMF have projected that emerging/developing economies will grow by 4.5% in 2017, versus just 2% in developed economies. If governments in such emerging and developing economies want to entice and sustain foreign investors and innovators, they would need to focus on serious legislative strategies early on, that would not only benefit businesses but also citizens. While developing countries can ‘learn’ from some of the experiences of developed countries, they would still need to design policies that meet their own needs and which fit their local setting. For instance, policies in developing countries need greater focus on regional and gender inclusivity and other technical and social issues to reduce inequality and enable participation of the underprivileged in the digital economy. Regulatory reforms are also needed that ensure platform operators’ responsibility when it comes to protection of users against exploitation and hazards. It is evident that the challenges of regulation exist not only within developed economies but also in developing economies, when it comes to digital platforms. New legislation needs to be put in place as developments in digital technologies grow. While one may insist that it’s “a grey area”, reform in existing regulatory frameworks is paramount and urgent, especially in developing countries with weak institutional settings, inadequate education systems and large pools of labour. It will ensure that such aspects as the sharing/gig economy will serve as an opportunity rather than be used as a tool for exploitation.